wow that is a very interesting design! What's it's function David? You know Thomas, I don't know. We couldn't go into the tower because it was closed, whether permanently or temporarily I don't know. I suspect it marks the stadium when approaching through the parkland and perhaps as a lookout over the city. I think it is too tall and too small to be used for commentary and I don't think it would have been built with cameras in mind in the 1930s but again it is too tall for anything but a birdseye view of play. Needs more research. 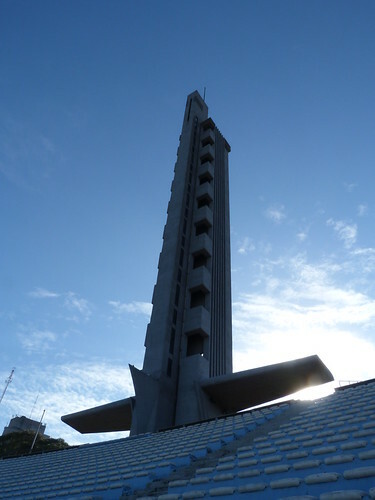 The Centenario's Torre de los Homenajes (Tower of Homages) was originally designed to honour the winning soccer teams, with their flags. The architect, Juan A. Scasso, had also planned to include the sculpture of a Winged Victory (Greek style) at the base between the two 'wings', but it was never carried out. The tower was also built as a lookout over the city, and Scasso's plans included an elevator, which was never built. Thank you Alvaro. Good to get some information from someone who knows. We had a great time in Montevideo and would go back at the drop of a hat. A great city! Thank you very much Gonzalo. Your English is excellent and much better than my Spanish. We asked if we could go up in the tower but while we understood that it was closed we didn't understand enough to know whether it was a permanent situation or just a short term thing.